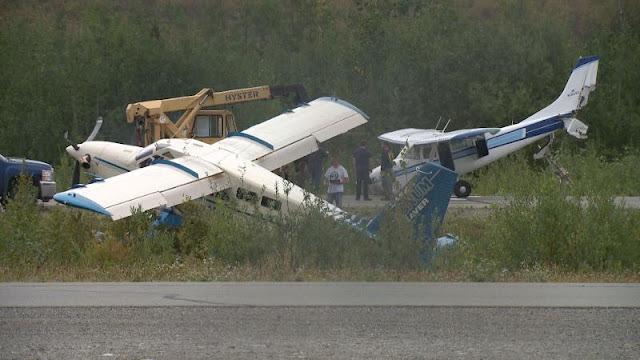 On August 5, 2016, about 1340 Alaska daylight time, a Cessna 210-5 airplane, N1839Z, and a turbine-powered, tailwheel/ski-equipped, de Havilland DHC-2T (Beaver) airplane, N30CC, collided midair while landing at Wasilla Airport (PAWS), Wasilla, Alaska. The certificated flight instructor and student pilot on board the Cessna sustained minor injuries, and the commercial pilot and passenger on board the de Havilland were not injured. Visual meteorological conditions prevailed in the area at the time of the accident. The Cessna was registered to Flying High, LLC, and it was operated by the student pilot under the provisions of Title 14 Code of Federal Regulations (CFR) Part 91 as an instructional flight. The Cessna departed Merrill Field Airport (PAMR), Anchorage, Alaska, about 1230. The de Havilland was privately owned, and it was operated by the pilot under the provisions of 14 CFR Part 91 as a personal flight. 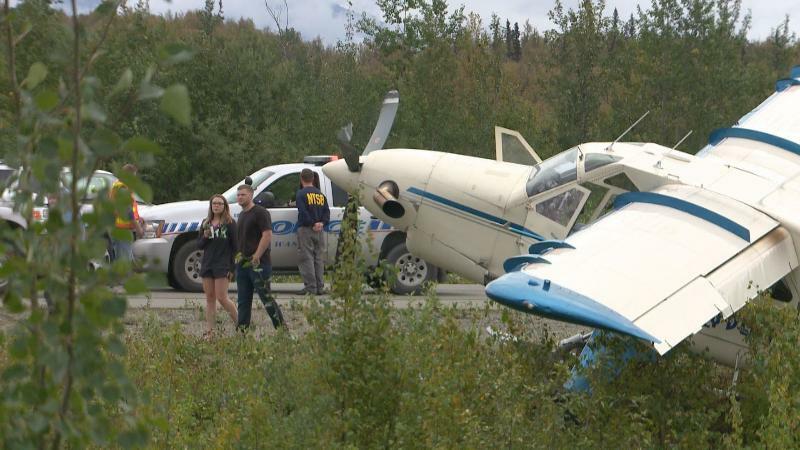 The de Havilland departed Leisurewood Airstrip (9AK6), Wasilla, Alaska, about 1340. Neither airplane was operating on a flight plan. The instructor on board the Cessna stated that he and the student departed from PAMR to conduct basic instrument flight training before proceeding to PAWS to practice landings. He said that, after arriving at PAWS, the student completed three successful stop-and-go landings on runway 4 while using the published right traffic pattern. He added that he was using the airport's common traffic advisory frequency (CTAF) of 122.80 MHz to announce their positions and intentions throughout the series of stop-and-go landings. The Cessna had two communication radios installed and the instructor and student reported that they utilized the Narco COM IIA radio while at PAWS, due to the presence of static when the Garmin GNS 430 radio was operated. 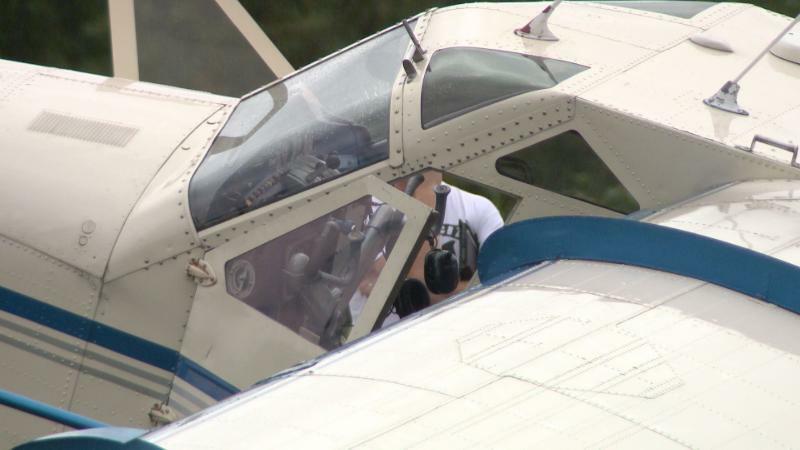 The instructor stated that, during the accident landing, just as the student began the landing flare, there was a sudden loud noise, and the airplane abruptly nosed down. The airplane's nose subsequently impacted the runway. The instructor reported that neither he nor the student heard or saw the other airplane before the collision. The instructor additionally reported that the airplane's landing and navigation lights were on at the time of the accident. 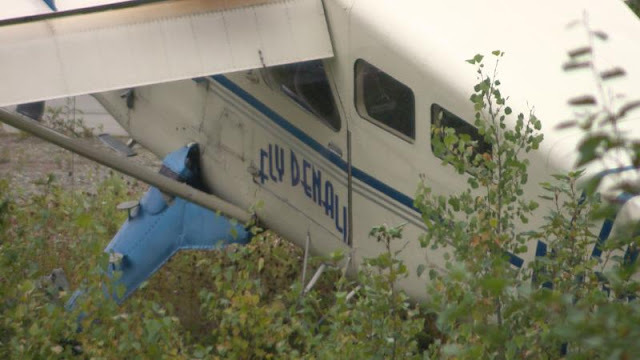 The pilot of the de Havilland stated that he and his passenger were en route to PAWS to get fuel before continuing to Healy, Alaska. 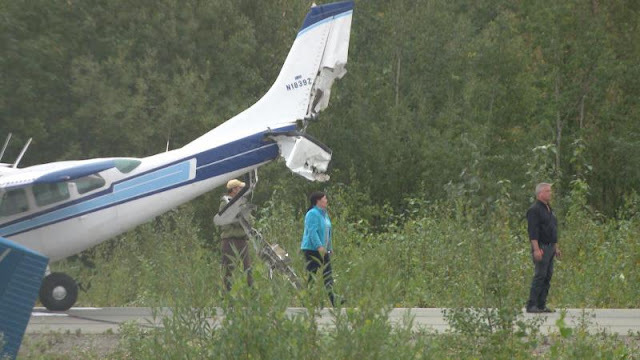 He stated that, after departing from 9AK6, which was located about 5 miles northwest of PAWS, he conducted a straight-in final approach for landing on runway 4. He further stated that, while on final approach, about 70 ft above ground level (agl) over the runway threshold, the Cessna overtook the de Havilland from directly above, impacting the propeller. 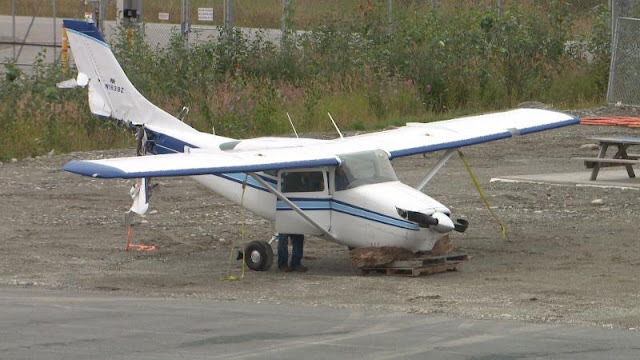 Following the impact with the Cessna, the pilot continued the approach and landed on runway 4. 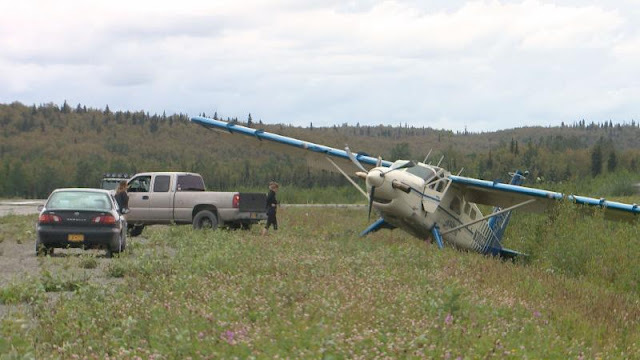 The pilot was able to maintain control and maneuver the airplane off the runway to avoid impacting the Cessna. The de Havilland subsequently departed the left side of the runway and came to rest in about 5 ft high vegetation on sloping terrain. The pilot stated that he used the CTAF before and after entering the straight-in final for runway 4 at PAWS, announcing his positions and intentions. The pilot reported that neither himself nor the passenger heard or visually acquired the Cessna before impact. The pilot additionally reported that the airplane's landing and navigation lights were on at the time of the accident. Both airplanes were equipped with the required communication equipment for the airspace in which they were operating. Neither airplane was equipped with an automatic dependent surveillance – broadcast (ADS-B) system, nor was either airplane required to be equipped with such a system. The fixed-gear, high-wing, single-engine airplane was manufactured in 1962. The airplane was configured with seating for 2 pilots and no passengers. The airplane was powered by a Continental IO-470 reciprocating engine. The airplane was white with light blue and dark blue accent lines, white wings, a chrome propeller spinner, and a black 2-blade McCauley propeller. The tailwheel/ski-equipped, high-wing, single-engine airplane was manufactured in 1964. The airplane was configured with seating for 1 pilot and 9 passengers. The airplane was powered by a Pratt & Whitney Canada PT6A-34 turbine engine. The airplane was beige with light blue and grey accent lines, beige wings, a beige propeller spinner, and a black 3-blade Hartzell propeller. PAWS is located about 3.5 miles southwest of Wasilla, Alaska at an elevation about 350 ft above mean sea level. The hilly terrain surrounding the airport is heavily wooded and populated with residential neighborhoods. PAWS has a mixed population of general aviation tenants and commercial aviation tenants, with a variety of airplanes and helicopters stationed at the airport. 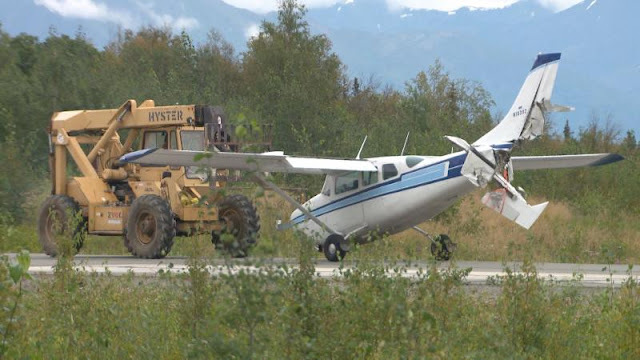 The airport is operated by the city of Wasilla, Alaska. PAWS is within Class G airspace at the surface; Class E airspace begins at 700 ft above the surface. The airport was not equipped with a control tower. PAWS was equipped with 2 parallel runways; Runway 04S/22S measured about 1,690 ft long and about 60 ft wide and was composed of turf and gravel. Runway 04/22 measured about 3,700 ft long and about 75 ft wide and was composed of asphalt. The published traffic pattern for runway 04/22 is right traffic. PAWS does not have a published VFR traffic pattern altitude. 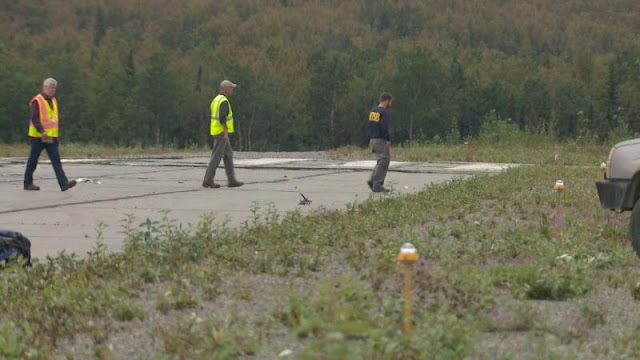 The National Transportation Safety Board (NTSB) investigator-in-charge (IIC), three aviation safety inspectors (ASI) from the Federal Aviation Administration (FAA), along with a team of law enforcement officers from the Wasilla Police Department traveled to the accident scene on August 5. The NTSB IIC and the FAA ASIs performed accident site documentation, examined both airplanes, and interviewed the occupants of both airplanes. A postaccident examination of both airplanes, revealed signatures consistent that the initial impact sequence was between the empennage of the Cessna and the propeller assembly of the de Havilland. The substantial damage sustained to the empennage of the Cessna during the impact sequence rendered the airplane uncontrollable and impacted the runway. The de Havilland pilot was able to maintain control and maneuver the airplane off the runway to avoid impacting the Cessna; however, the de Havilland sustained substantial damage from the Cessna impacting its right wing. During the examination of both airplanes at the accident scene revealed that, when power was applied, the 122.80 MHz frequency was displayed for each radio selected in each airplane. The pilots of both airplanes stated that there were no preimpact mechanical failures or malfunctions that would have precluded normal operation of their respective airplanes. A CTAF recording for PAWS was obtained from a private individual. 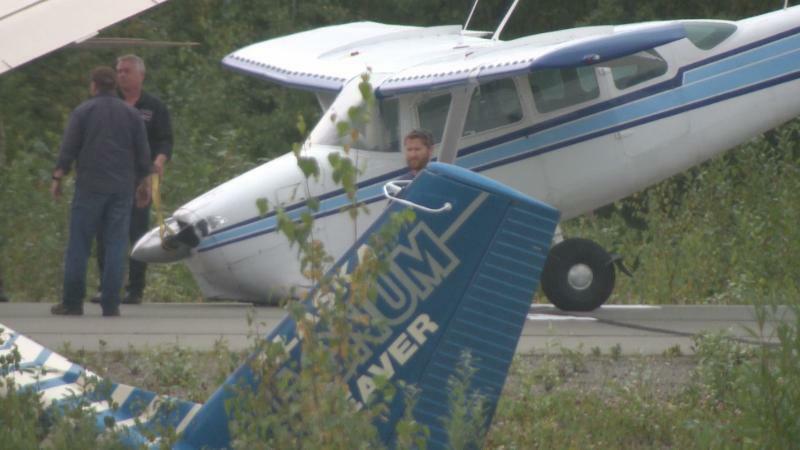 The Cessna instructor could be heard making position reports during the three previous traffic patterns for the stop-and-go landings. No transmissions were heard from the Cessna instructor or student during the accident approach. The pilot of the de Havilland made two transmissions. 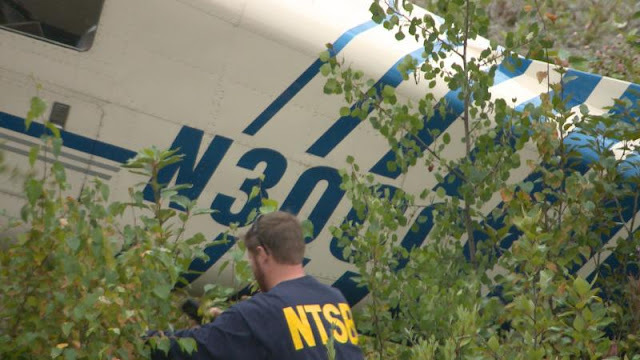 During the first, he indicated that the airplane was "inbound from the north 3 miles out." 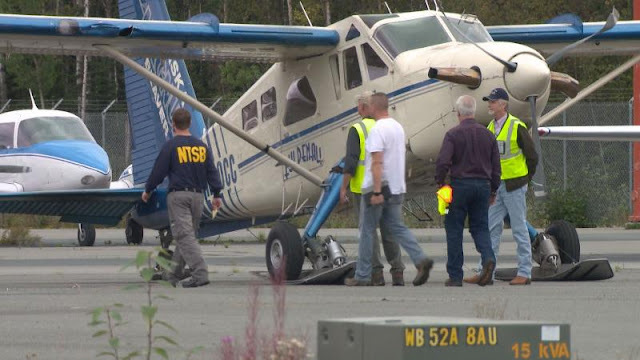 The second transmission was, "Wasilla Area Traffic, Beaver Charlie-Charlie will be entering a -- coming in from the north left will be 4, Runway 4, Wasilla." For more information, refer to the PAWS CTAF transcript in the public docket. Garmin GNS 430 (using left side of cockpit headset port). COM1/COM1 (frequency) MIC (microphone) selected. Transmit and receive were loud and clear. Narco COM 11A (using left side of cockpit headset port). COM2/COM2 (frequency) MIC (microphone) selected. Transmit was weak, receive was loud and clear. Garmin GNS 430 (using right side of cockpit headset port). COM1/COM1 MIC selected. Transmit and receive were loud and clear. Narco COM 11A (using right side of cockpit headset port). COM2/COM2 MIC selected. Transmit was weak, receive was loud and clear. No malfunctions or failures were noted with the Garmin GMA 340. Refer to the N1839Z Radio Testing Report in the public docket for more information. 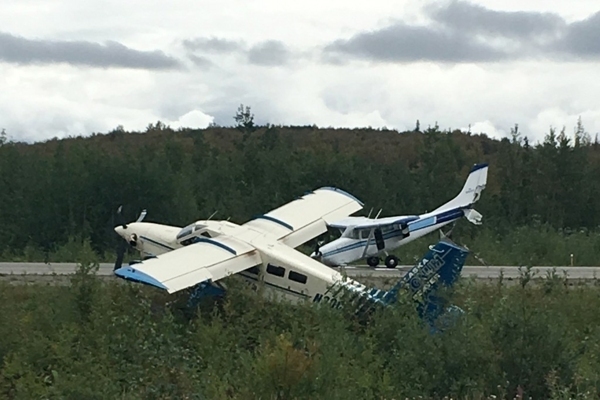 Additional postaccident examination and testing of the Cessna's two radios was conducted on August 23 at Northern Lights Avionics, Inc. (an FAA-authorized avionics repair station), Anchorage, Alaska, with oversight from the NTSB IIC and an NTSB air safety investigator. No malfunctions or failures were noted for the transmit and receive function checks for the Garmin GNS 430 and the Narco COM 11A. No malfunctions or failures were noted with the operational checks with the Garmin GMA 340. Refer to the N1839Z Northern Lights Avionics, Inc. Work Order in the public docket for more information about the checks conducted. An examination of the Cessna's maintenance records revealed no evidence of uncorrected mechanical discrepancies with the airframe. OpsVue track data was used to produce the flight tracks for the two airplanes. OpsVue is a commercially-available program that provides track data in a "mosaic" format, by taking all available surveillance data (ADS-B, radar track data, etc.) received from a transponder-equipped aircraft and applying "smoothing" to achieve the displayed flight track and overlaid onto satellite imagery. The track data showed a convergence of the two airplanes' flight paths about 0.80 miles southwest of the approach end of runway 04 at PAWS before the midair collision over runway 4. The precise altitudes captured for the two airplanes in the OpsVue track data could not be confirmed due to the way in which altitude information is corrected for barometric pressure within the OpsVue system. The pilot in command's primary responsibility is to see and avoid other aircraft and to help them see and avoid his or her aircraft. Keep lights and strobes on. The use of any traffic pattern procedure does not alter the responsibility of each pilot to see and avoid other aircraft. Pilots are encouraged to participate in "Operation Lights On," a voluntary pilot safety program described in the Aeronautical Information Manual that is designed to improve the "see-and-avoid" capabilities. It is recommended that airplanes observe a 1,000 ft agl traffic pattern altitude. Large and turbine-powered airplanes should enter the traffic pattern at an altitude of 1,500 ft agl or 500 ft above the established pattern altitude. A pilot may vary the size of the traffic pattern depending on the aircraft's performance characteristics. The FAA encourages pilots to use the standard traffic pattern when arriving or departing a non-towered airport or a part-time-towered airport when the control tower is not operating, particularly when other traffic is observed or when operating from an unfamiliar airport. However, there are occasions where a pilot can choose to execute a straight-in approach for landing when not intending to enter the traffic pattern, such as a visual approach executed as part of the termination of an instrument approach. Pilots should clearly communicate on the CTAF and coordinate maneuvering for and execution of the landing with other traffic so as not to disrupt the flow of other aircraft. Therefore, pilots operating in the traffic pattern should be alert at all times to aircraft executing straight-in landings, particularly when flying a base leg prior to turning final. 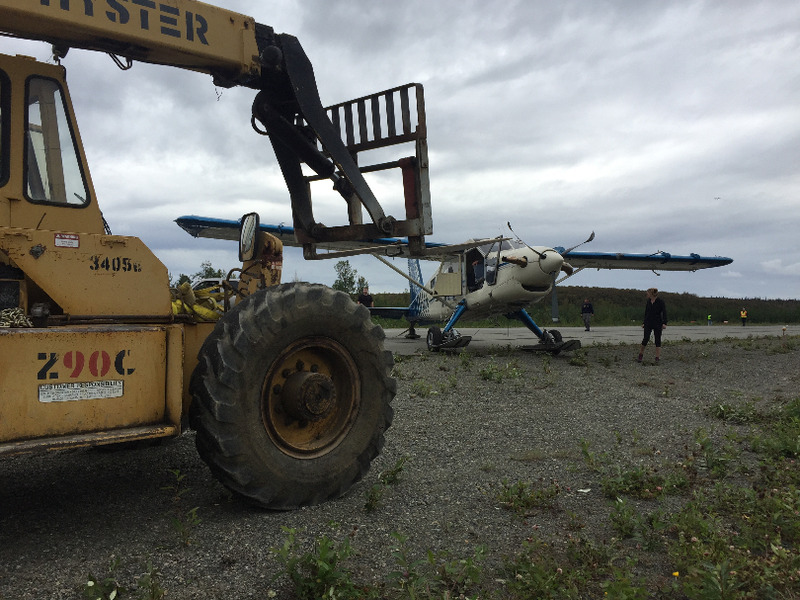 The FAA implemented national ADS-B technology in Alaska. Formerly known as Capstone, the joint industry/FAA program (which includes ground-based stations, satellites, and airplane avionics) currently provides pilots with situational awareness by displaying the airplane's position over terrain and warns pilots of the presence of other ADS-B-equipped aircraft that may be present, while using global positioning system technology coupled with an instrument panel mounted moving map display. Pilots should also keep in mind their responsibility for continuously maintaining a vigilant lookout regardless of the type of aircraft being flow. 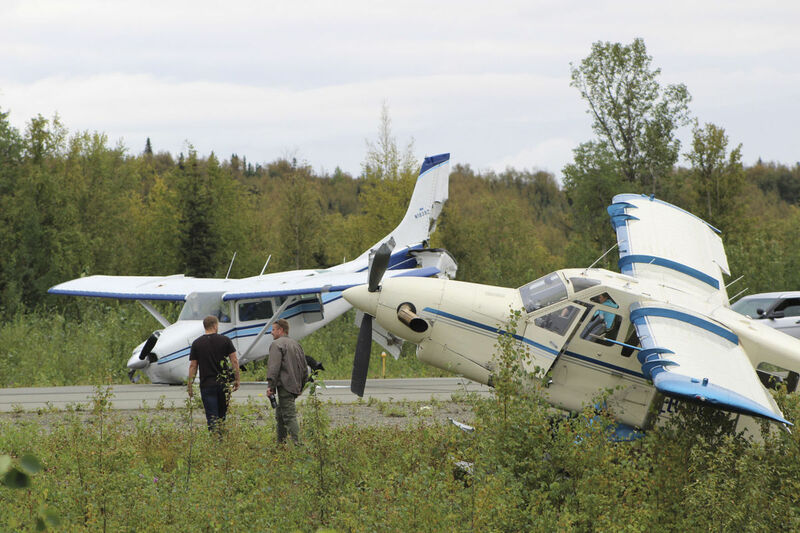 Remember that most midair collision accidents and reported near midair collision incidents occurred during good VFR weather conditions and during the hours of daylight. Cockpit workload and other factors reduce the time that pilots spend in traffic scans. 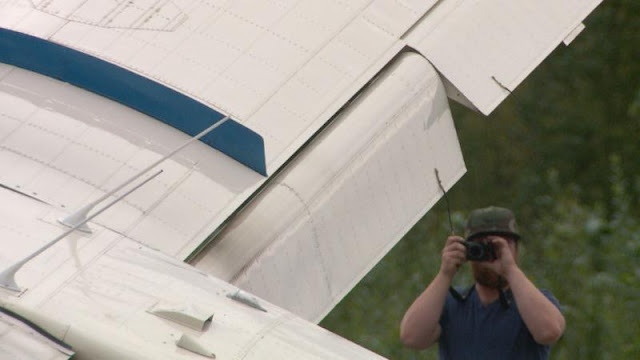 However, even when pilots are looking out, there is no guarantee that other aircraft will be sighted. Most cockpit windscreen configurations severely limit the view available to the pilot. The available view is frequently interrupted by obstructions such as window-posts which totally obscure some parts of the view and make other areas visible to only one eye....Visual scanning involves moving the eyes in order to bring successive areas of the visual field onto the small area of sharp vision in the centre of the eye. The process is frequently unsystematic and may leave large areas of the field of view unsearched….The physical limitations of the human eye are such that even the most careful search does not guarantee that traffic will be sighted….An object which is smaller than the eye's acuity threshold is unlikely to be detected and even less likely to be identified as an approaching aircraft….The human visual system is better at detecting moving targets than stationary targets, yet in most cases, an aircraft on a collision course appears as a stationary target in the pilot's visual field. The contrast between an aircraft and its background can be significantly reduced by atmospheric effects, even in conditions of good visibility. An approaching aircraft, in many cases, presents a very small visual angle until a short time before impact. In addition, complex backgrounds such as ground features or clouds hamper the identification of aircraft via a visual effect known as 'contour interaction'. This occurs when background contours interact with the form of the aircraft, producing a less distinct image. Even when an approaching aircraft has been sighted, there is no guarantee that evasive action will be successful. Almost all midair collisions occur during daylight hours and in visual flight rules conditions. Most collisions happen within 5 miles of an airport (during final or short final approach to landing), and usually on weekend afternoons. Pilots in Alaska need to communicate, listen, and maintain a visual scan in all areas where they take off and land such as lakes, rivers, gravel bars, and especially around airports.